In the current work, they explore the relationships between 38 physicochemical properties of 865 chemicals with chronic aquatic toxicity toward three model organisms: the Japanese medaka, a cladoceran, and a green algae. The 38 properties include, for example, molecular weight, number of freely rotatable bonds, aqueous solubility, and number of hydrogen bond donors and acceptors. 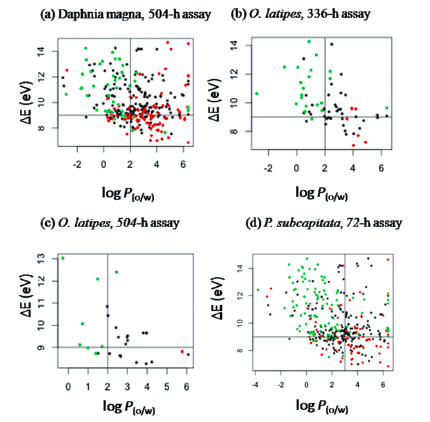 They first measure the correlation of single properties to toxicity and find the highest correlation (as judged by the correlation coefficient; see table below) between toxicity and the octanol-water partition coefficient (log Po-w) for both the medaka (O. latipes) and cladoceran D. magna), with a less strong correlation for the algae (P. subcapitata). 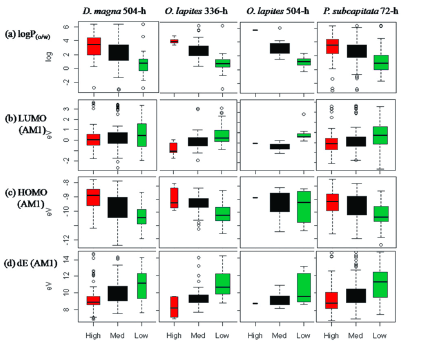 Additionally, the authors found a correlation between toxicity and the HOMO/LUMO gap (ΔE) for the algae. High correlations also exist between toxicity and the energies of the frontier molecular orbitals of the compounds (HOMO/LUMO). 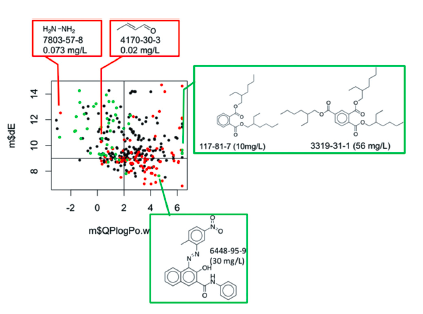 These correlations are not too surprising, as the log Po-w relates to how well a given molecule can partition from water to an organic medium (or across lipophilic biological membranes into an organism). The frontier molecular orbital energies, of course, relate to how reactive a molecule is (for example, a compound with a low-lying LUMO would be expected to react with nucleophilic amino acid side chains). They next perform a multivariate analysis and find that for a 2-property model, the two most important properties are log Po-w and either ΔE or the HOMO energy for all three species. Interestingly, for a 3 property model, the third property depends on the species. For the medaka and cladoceran, the third most important property for toxicity prediction is the number of H-bond acceptors, while for the algae it is the LUMO energy. To see how the four key properties impacted aquatic toxicity, the researchers explore their distribution (see the box plot below) against compounds grouped according to the EPA’s three levels of toxicity concern (high in red, medium in black and low in green). Consistent with the correlations described above, both log Po-w and ΔE exhibit strong trends, with lower partition coefficients and larger ΔEs corresponding to lower levels of toxicity concern. In contrast, the HOMO and LUMO energies show a much less significant trend, suggesting ΔE is a better guideline than either the HOMO or LUMO energies when designing a molecule. More powerfully, scatter plots of log Po-w vs ΔE provide threshold values for chronic aquatic toxicity. For all three species, the compounds of low chronic toxicity lie within one quadrant of the plot with boundary values of log Po-w of less than 2 and ΔE values greater than 9 eV. For the three species, applying these guidelines eliminates 90 % of the investigated compounds classified in the highest category of concern by the EPA! Lastly, the authors explore the outliers – for example, highly chronically toxic compounds that are wrongly classified by these new guidelines as ‘safe’. The discussion of the outliers is very detailed and worth reading (shown below are the results for the D. magna 504 hr assay), but one compound that caught my eye was hydrazine. The guidelines place hydrazine in the ‘safe’ region of the plot, whereas the EPA level of concern for this compound is high (hydrazine is a known carcinogen in mammals). As the authors point out, there are a few possible explanations for any incorrect classification: (i) the computed log Po-w or ΔE values are incorrect, (ii) the experimental toxicity threshold is inaccurate, or (iii) the design guidelines are inadequate for certain modes of action (MOAs) of certain toxicants. In the case of hydrazine, according to the authors, the MOAs are poorly understood in aquatic organisms making the last explanation potentially the correct one. They also note that the acute toxicity of hydrazine makes measuring chronic toxicity difficult. These guidelines are obviously very exciting and easy to use (I think I could handle measuring log Po-w and computing ΔE!). Going forward, I’m interested to see how the authors change the guidelines to include the outliers. In particular, I’m excited to see how they incorporate the biodegradation products of the compounds and whether that impacts the number of outliers using their guidelines. By tmckeagberkeleyedu in Toxicology on May 15, 2012 . Great post. Are the guidelines that result in acute toxicity similar to those that are required for desirable biological activity? And if not, what does this mean about the different targets that you hit for a desirable biological effect versus those that are hit when something is toxic? Is this a reasonable type of generalization? How does delivery factor into this? Would the compounds still be as toxic if there were delivered intravenously (not possible with algae)? Very good questions that I’m unfortunately not particularly qualified to answer! Hopefully a reader trained in med chem/toxicology can fill us in! Just off the top of my head, though, I would expect the biological activity of many therapeutics to result from their specific interactions with a target biomolecule. Acute toxicity, in contrast, often results from narcosis, which I think is the non-specific disruption of cell membranes by hydrophobic molecules. This would be something that could then be avoided by intravenous delivery (though the acute toxin might also have chronic effects after injection). However, chronic toxicity often results from specific interactions between the toxicant and its biological target(s), the same sorts of interactions targeted by therapeutics, which lead to both their desired effects and their undesired side effects. Hopefully, med chemists’ knowledge of specific receptor/ligand interactions coupled with these guidelines would result in pharmaceuticals with fewer side effects. For example, a drug could be designed to have a safe partition coefficient and HOMO/LUMO gap from the start, but then highly optimized with respect to the properties for the drug’s target (H-bond donors/acceptor, globularity, etc) that don’t correlate as strongly with chronic toxicity.